When working with the Harmony solution and Toon Boom Harmony Server, all scenes and their data are stored directly on the server, no data is saved or stored on the client machine. The client machines access the database and load the scenes and drawings directly from the server. Each time the user saves his scene, the data is updated directly on the server. There are no upload or download operations done between the server and the clients. Harmony has a lock system, referred to as Global Lock, for the different scenes and scene assets. As all the data on the server can be accessed directly and modified from any client machine, by default, the scenes are locked and the users need to get the rights to modify them in order to save their work onto the server. Only one user at the time can modify a scene. Once a scene is opened on a client machine, the other users can only open the scene in read-only mode if they need to consult it, but they will not be able to save any modifications. 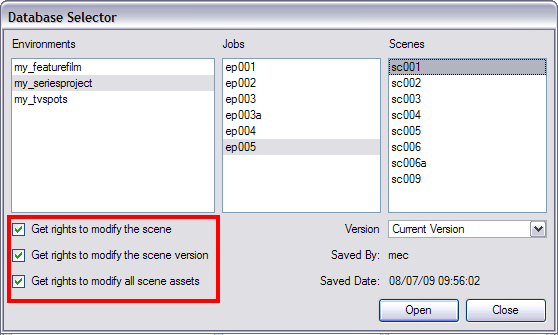 Allows the user to modify the selected version of the scene and have access to the version manager during the opened session. Allows the user to modify the currently selected scene version but locks access to the version manager during the opened session. Automatically gets all the edit rights for the selected version of the scene. This option is only recommended if you are certain that the selected scene can not be opened for editing by several users at the same time. Large studios should avoid this option. • Managing Environments, Jobs and Scenes topic.